More social history and a tale of fortitude and relationships forged under tough conditions, than a book about a rowing race. This was a fascinating period, when the US was experiencing difficult economic and climatic conditions. 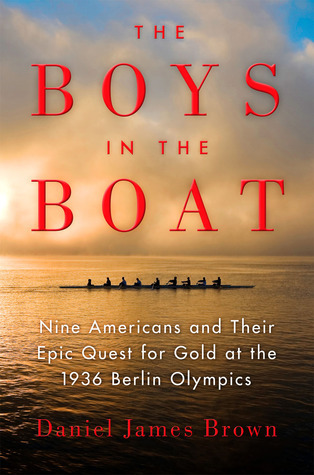 From the turn of the century through the run up to WWII, the lives of Joe Rantz and his fellow rowers and coaches describe the impact of the great depression on the lives of working Americans. This coupled with the population movements that resulted from the dust storms that started to blow up in the early to mid 1930’s, causing huge numbers of people to go in search of work. Through all of this, well heeled and poor alike came together to compete for a place in the first crew of the University of Washington. The training was arduous and the competition fierce, not just locally, but also against their main west coast rivals, the University of California. In parallel, over in Europe, nazism was taking hold and Hitler, through his chief propogandists Goebbels and the film director Leni Riefenstahl, were looking to promote a grand image of Germany and nazism through hosting the 1936 Berlin Olympics. Each thread of the book is fascinating and the balance between the social history, the personal stories and the rowing is done so well that it’s very readable whether you are into the sport or not. But if you are, the descriptions of the races themselves are gripping, and it’s surprising to the contemporary eye that they attracted massive public interest - rowing was a big sport back in those days! The culmination of it all was, of course, a huge victory for the US crew, despite Germany and Italy being given favored lanes in the final race. It’s a great read and there’s barely a page you would skim through lack of interest. Sign into Goodreads to see if any of your friends have read The Boys in the Boat.